TONIGHT. Important Topics at Kingston’s Planning Board Meeting. What They Are and What You Can Do. At tonight’s City of Kingston Planning Board meeting, there are three topics that we are following. You can view them below to learn what they are and suggestions for what the public can do. Item #7: #261 Flatbush Avenue SPECIAL PERMIT/SITE PLAN to install a wireless service facility/communication tower. SBL 48.74-4-31. SEQR Determination. Zone RR. Ward 7. Cellco Partnership d/b/a Verizon Wireless/applicant; John & Tirzah Sheehy/owner. Of note, the location of this tower is in close proximity to one of Kingston’s public housing complexes. Review the minutes from October’s meeting VIEW (item #8). 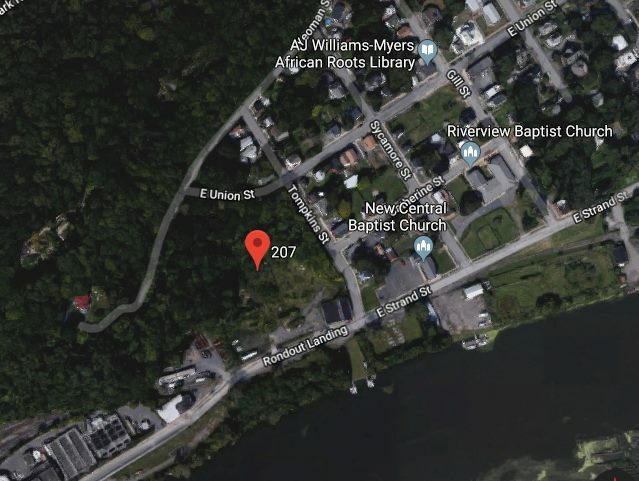 The item was tabled and sent to the Ulster County Planning Board for review (we are currently requesting the outcome of their November meeting. More information shortly). The need for further study can be presumed (balloon tests, radiation concerns, generator noise, etc.). Citizens can inquire during tonight’s public hearing whether or not this project has the criteria to be determined a Type 1 Action in SEQR. A Type I action carries with it the “presumption that it is likely to have a significant adverse impact on the environment and may require an EIS”. Irish Cultural Center Hudson Valley located at 32 Abeel Street in the Rondout, Kingston. Item #8: #32 Abeel Street SITE PLAN to construct a 16,213 sf community center. SBL 56.43-5-35.100. SEQR Determination. Zone RT, Rondout Historic District, HAC. Ward 8. Irish Cultural Center Hudson Valley Inc.; applicant/owner. According to Grow the R/T Responsibly, “The Irish Cultural Center of the Hudson Valley (ICCHV) is proposed to be a 16,000sf three-story “community center” with a pub, outdoor seating, roof garden, and 171-seat theater on .43 acre parcel at 32 Abeel Street with 8 parking spots. Since meetings in 2012, neighbors have brought up concerns about parking, traffic, and the building size; more emphatically since 2015 after the ICCHV allowed its first site plan approval to lapse and submitted a new application with a bigger design and scale. After 2 ½ years, it gained approval for its new application. Then, the ICCHV committed multiple violations in its first stages of construction, had a hard time securing a $200,000 performance bond required by the City, and allowed its site plan approval to lapse a second time. Tonight, the ICCHV seeks site plan approval of its project for the third time. This is not a public hearing on the project as the ICCHV has not yet submitted a new application. This is a public hearing on what the Planning Board’s process should be on this third application for site plan approval by the ICCHV. Citizens can ask that the Planning Board re-open the SEQR review, and for it to be more comprehensive in light of the adverse impacts already generated by the excavation work performed by ICCHV in May 2018. Under new business: Item 9: #181-207 East Strand SITE PLAN to construct a 12,500sf boat restoration and repair facility. SBL 56.36-1-6.Zones M-2. Ward 8. Paul Jankovitz/applicant; Historic Kingston Waterfront LLC/owner. Also, a discussion regarding lot line revisions for lands of Ianucci, along the walkway. Item #11: #108, 124-134, 136-198, 181-207, 200-206, 208-216, 222, 224-258, 260-270 East Strand and 2, 3, 6 North Street LOT LINE REVISION of the Lands of Historic Kingston Waterfront. SBL 56.43-6-5 & 6, 56.36-1-6, 8, 9, 10, 11, 12, 13, 14, 19, 20. SEQR Determination. Zones RF-R & M-2. Ward 8. Paul Jankovitz/applicant; Historic Kingston Waterfront LLC/owner. Tonight is the first time the developer will give a public presentation. It is not a public hearing. Although I expect there to be plenty of items to address going forward, I would advise citizens to observe tonight’s presentation first before making comments for or against the ‘Super Garage’ project. If you do wish to comment, you can sign-up to speak at the top of the planning board meeting. According to the agenda, there is a 15 minute comment period starting at 6 pm so hopefully, the Planning Board will grant more time. Prepare comments to be 2 minutes or less in the case that there are many speakers. OF NOTE: The proposed project is not located in a Historic District even though the project would require the potential demolition of historic resources (Newark Lime and Cement Building is located on the property). There are probably important archeological objects on or near the site as well. During the last major hurricane incident (Irene) the Rondout Creek crossed the street and as I understand it, flooded the basement level of the structure. The Heritage Area Commission does have purview over this location because of Kingston’s LWRP (Local Waterfront Revitilization Plan) that was created in the early 90’s. 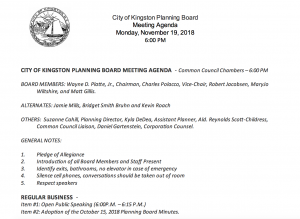 Although sea level rise was not addressed back then, Kingston’s Conservation Advisory Commission has been charged to look closely at that recently. 2018 General Election Ballot and Proposal No. One “An Amendment for Independent Redistricting”. The whole area flooded during Hurricane Sandy too! That flooding was much worse than Hurricane Irene and led to Mayor Gallo setting up the Kingston Waterfront Tidal Task Force in late 2012.
where the Rondout Creek meets the Hudson at the Rondout Lighthouse. Promising developments such as a greenway and increased public access for recreational uses were anticipated as improvements benefiting both neighborhood, Kingston residents and tourists. It was with great dismay when a developer ditched a huge, rusty, derelict ship in the center of that beautiful vista, obscuring the view from the residential neighborhoods nearby. It was a hostile,inconsiderate and unfriendly thing to do. The developer left it there for months. The rusty, unsightly derelict ship in fact still there. To add insult to injury, the developer, originally from the New York City area, now proposes a four story boat repair facility impinging on the same residential neighborhood. The Strand Waterfront is a example of commercial restraint,respecting the beauty of the Hudson Harbor area. Marinas are located further down the Rondout near Dock St, and cross the Creek near Connelly. Marinas continue down the creek towards Eddysville. But there is a huge shipyard at Wilbur Ave and Abeel St, where large ships are repaired. This developer owned a waterfront residence in this same area. Why not put his cumbersome, boat repair garage near this pre-existing shipyard in that pre-existing commercial district,where marinas already exist, where he has lived, rather than damage or destroy the incredibly beautiful natural views of the Rondout and Hudson River meet.